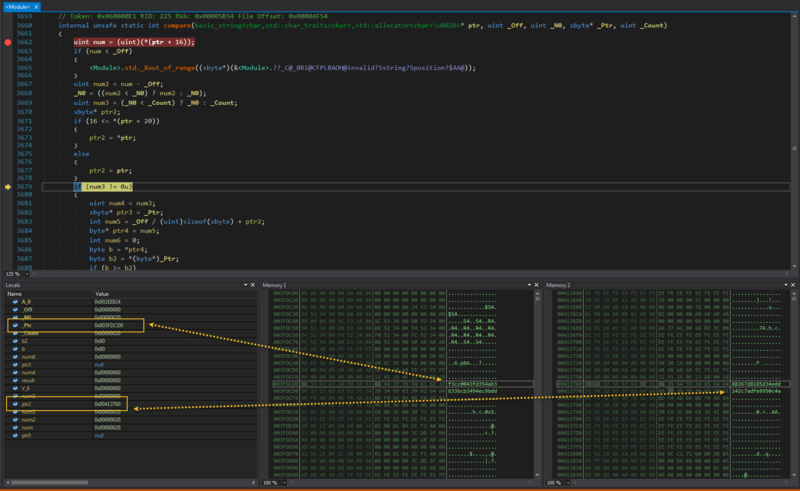 I'm reverse engineering the CrackMe which is written on Managed C++/C#. Arguments are "string" (email in this case) and "serial". Serial is somehow depends on string and I need to understand how. mean on line 25 of button2_onClick? I understand that this is some type of assignment, but no more. 2) What these lines (14, 15 lines and so on, of Check()) do? 3) What do the numbers (5, 6, 7 near the end of lines) mean? 4) Is it just a comparison of two strings in disguised form? 5)Maybe there's a easier way which I don't know to solve this crackme? I firstly tried to use IDA as always, but that wasn't really helpful in this case. Looks like a copy ctor, so my judgement would be the same as yours - assignment. I would assume that's sets value 0 at the specified offset. EDIT: that's partially true, upon further investigation it looks like that at index 16, the length of the string is stored, and at index 20 it's some kind of type. If value @20 is > 16 then the string is in fact a pointer to memory region where the string is stored. For shorter strings it is stored internally. So setting those two to 0 is initialization/reseting the values. This is compare method, the signature is: System::String::Compare(strA, indexA, strB, indexB, len). In your case it compares content of variable string starting from index 0 with the further part of the same variable - above index 16. Everything you need to know is in the check method. Why not debug it? dnSpy can do that. By the quick look it calculates MD5 from the Email, but there are some parts that require a bit of further investigation and you did not provided the full binary. Some questions what does <Module>.GetString() returns? - it looks like it's essential to the calculation. Also this <Module>.? ?_C@_00CNPNBAHC@?$AA@ is probably a const string. we can there inspect the variables & addresses that are in fact memory locations that are containing the values. maybe you can't inspect them from Locals, but if you press CTRL+G, and type the memory location you will be taken where you need to be. Not the answer you're looking for? Browse other questions tagged .net crackme c# or ask your own question.